HomehistoryWhat Would A 19th Century Lady Read? Let’s start with one of my favouirte genres: biographies. The Victorian historian Agnes Strickland published several, including Lives of the Queens of England, The Letters of Mary Queen of Scots, and Lives of the Tudor Princesses, Including Lady Jane Gray and Her Sisters. Although some of these biographies contain some mistakes, they still are fascinating, and informative, reads. Pride and Prejudice, Sense and Sensibility and the other works of Jane Austen were very popular. Although her books are love stories, they aren’t simple and superficial. On the contrary, Jane portrayed, in her witty style, the hypocrisy, customs and habits of the society she lived in. Another author who denounced the evils of his time in his works was Charles Dickens. The Pickwick Papers, The Adventures of Oliver Twist and David Copperfield are just some of the masterpieces that are still loved and admired today. For those into historical novels, there were Walter Scott’s works. Waverley, Ivanhoe and Kenilworth, to name but a few, were novels set in Scotland and England that covered similar themes, such as Jacobitism, the ’45 rebellion, the idea of Scottishness and the social changes in these countries throughout the centuries. These novels are all very enjoyable even today. A young lady can’t read only books, can she? Magazines such as The Ackermann’s Repository, La Belle Assemblee and Ladys Monthly Museum were very popular. They gave advice on household matters, features short stories, novels and conundrum to entertain readers and fashion plates to keep them up to date with the latest styles. Those looking for a lighter read found it in Fanny Burney’s novels. 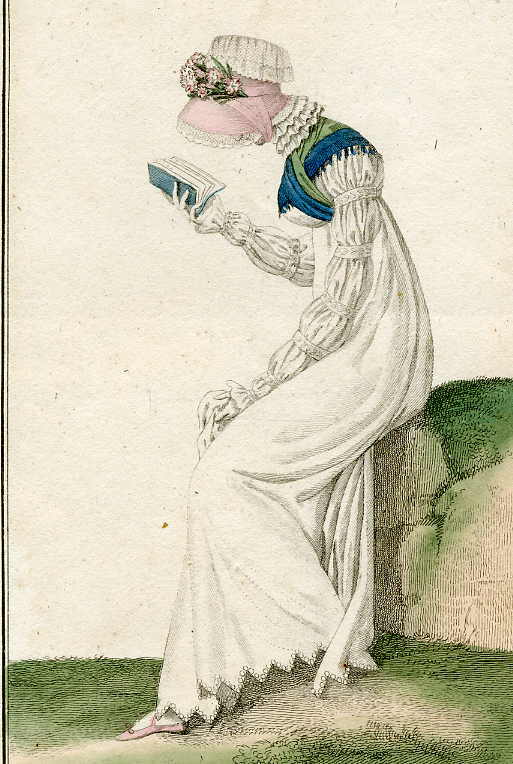 Fanny, who had been a reader to Their Majesties George III and Queen Charlotte, wrote Evelina, Cecelia, and Camilla. They feature young heroines who, having reached marriageable age, have entered society to find a good husband. Burney’s works too are a satire of the society she lived in, but not as incisive and profound as that expressed in Austen’s novels. Wuthering Heights by Emily Bronte created a stir when it was released in 1847. Although praised for its originality, it received scathing criticism for the unpleasantness of its characters and the story. An older novel that would have been embarrassing to own (which, of course, made people all the more keen to read it) was The Monk by Matthew Gregory Lewis. Written in 1795, it tells the story of a young woman who, in love with an abbot, disguises herself as a monk to enter his monastery. But this is not just a story of forbidden love. The woman, in fact, turns out to be a demon! Ann Radcliffe was (and still is) the undisputed queen of the gothic genre. The Mystery of Udolpho, The Castle of Wolfenbach, The Italian and A Sicilian romance were spooky, and for the time, scary stories involving beautiful and young heroines persecuted by nasty (although often good-looking) villains. And of course, a good-looking, but good, hero would eventually come to their rescue. The stories were often set in convents and castles, complete with their own ghosts, that were pervaded by an eerie and mysterious atmosphere. One of the very first examples of science fiction, which also included gothic and romantic elements, was released anonymously in 1818. The title was Frankenstein and, as we all know, its author Mary Shelley. The scientist Victor is obsessed with the idea of conquering death and comes up with a technique to bring inanimate bodies to life. But once his “dream” comes true, he’s horrified by what heìs done and abandons the creature. Alone and lonely, the creature asks Victor to create a companion for him, but he refuses, with disastrous consequences for everyone. Although the book is not scary by today’s standards, it is still a masterpiece that poses some very deep questions about life, death and immortality. So far, we’ve mostly discussed books young women wanted to read, but what about what their parents wanted them to read? They would, of course, chose for their offspring edifying books. And what’s more edifying than the Bible? Another popular book (but not very much loved by the young women forced to read it) was Sermons to Young Women, a collection of sermons by James Fordyce published in 1766. Considered a good orator, Fordyce believed women were weaker than men and were so to obey them in all things. What would you have read in the nineteenth century?